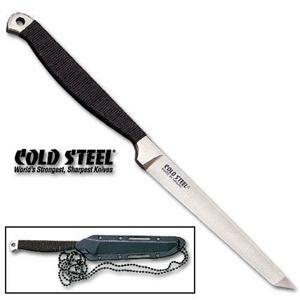 Finally, a serious boot/neck knife from Cold Steel -- previous offerings from that renowned self-defense company were not always up to Cold Steel's no-nonsense standards. This tanto-style knife, designed by Barry Dawson, is one of seven blade styles available and probably also the most sensible. The tanto blade was made to penetrate armor -- this knife does that, and a little more. The neck knife or boot knife obviously isn't intended for everyday use -- it's a tactical backup blade. Made for hanging on a lanyard in its small Secure-Ex sheath or lashed to other gear, the neck knife isn't full-sized but it's capable of full-sized work. The Spike is made from one piece of tempered 420 high carbon steel that's a full 7/32 inches thick. The 4-1/2-inch tang handle undergoes minimal shaping -- just enough to soften the sharp corners of the knife blank -- before being tightly wrapped with a grip of black nylon cord. Shaped with a flat grind for extra strength, the knife blade has the penetrating shape of a spike bayonet but only 2.5 ounces of weight. A blade with a cross section this thick will be hard to sharpen, but it isn't meant for everyday chores. The tanto was built to penetrate armor -- the handle on this one is a little slender, so get a good grip on it before trying it out. A slip could be painful. Anyone who has worn dog tags knows how they bounce and jangle if you wear them around your neck, which is why in real life they wind up tucked in boot tops. That same lesson applies to rigging the Cold Steel Spike Tanto, which if hanging loose quickly becomes a hazard. The Secure-Ex sheath is a tight fit for the Spike, but neck knives have been known to work loose. Strapping the sheath to accessible gear is a reasonable approach for most people. Unless otherwise licensed, keep the tanto in plain sight.